Whew! What a mouthful. I'm on the hunt for the perfect eye cream. No, I'm serious. I have these serious dark circles underneath my eyes that refuse to go away, no matter how many hours I sleep, no matter how many cucumbers I put on them. They just won't go away! It's sad, actually, I use to have perfect under eye skin. Clear, normal coloured, never got puffy, never got dark - no matter how little sleep I got. Then...I started to get older! I want to blame stress...okay, maybe I will. But it was like BAM! Overnight and I had nasty dark circles. I drink lots of water, I do eye masks (I love My Beauty Diary - who doesn't?). All to no avail. Being the crazy I am, I've decided that there HAS to be an eye cream out there. I'm more than willing to spend the money to get rid of them (is there a surgery out there?)! Alas, this magical product still alludes me. 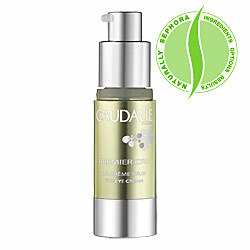 I've tried drugstore brands to premium brands to organic and natural products and nothing....So, to my surprise, in my first ever Glymm box, I received a Caudalie Premier Cru The Eye Cream sample. It's this tiny little thing. I'm thinking to myself, no way this is going to last me more than a week. It's been about three now and I probably have enough to finish off this week. Surprising isn't it? I guess this is like one of those life lessons - never judge a package by it's size. Am I right ladies? No? Well, I tried. This is what the full product looks like (if you want to see my sample size, please check out my December Glymm Box post). It retails for $95 for a 15ml bottle on the Glymm website. to me, that's a little on the small size. That's like $6.33 per ml! Funny thing is, it retails for $95 US on the Sephora website. I don't know what it retails for at the Canadian Sephora stores. For once, cross border shopping ain't so grand! When I initially squeezed the product out of the sample tube, I thought that the cream looked quite thick but very creamy. It was gold and had a little bit of shimmer to it. There was little fragrance to the cream. I applied a little bit, enough to feel the moisture on my skin underneath the eye. By the time I had finished my second eye, the moisturizer I had applied under the first eye was pretty much absorbed already. There's nothing I hate more than an eye cream that just sits there. It was wonderful and glorious! Instantly, I noticed that my circles were a little lighter, but I'm guessing that it's from the shimmer, but when I looked closely, I didn't see any shimmer on my skin, nor did it look like the cream was just acting like "cover up". I applied this cream twice a day, as per instructions and sometimes, if I managed to get a little more sleep and have a little less stress in my life because deadlines were met, I notice that my circles are diminished a little. But if I'm particularly tired or worried about something, I see that they are back with a vengeance. If this product wasn't as expensive as it is, I would totally purchase it. It was light, made a temporary difference and heck, it's all natural. Maybe I'll purchase it with a Sephora discount (the friends and family or whatever), but without some sort of subsidy, I must continue my search for the holy grail of ridding under eye circles.